This image, taken by the panoramic camera on the Mars Exploration Rover Opportunity, shows a close up of the rock dubbed "El Capitan," located in the rock outcrop at Meridiani Planum, Mars. 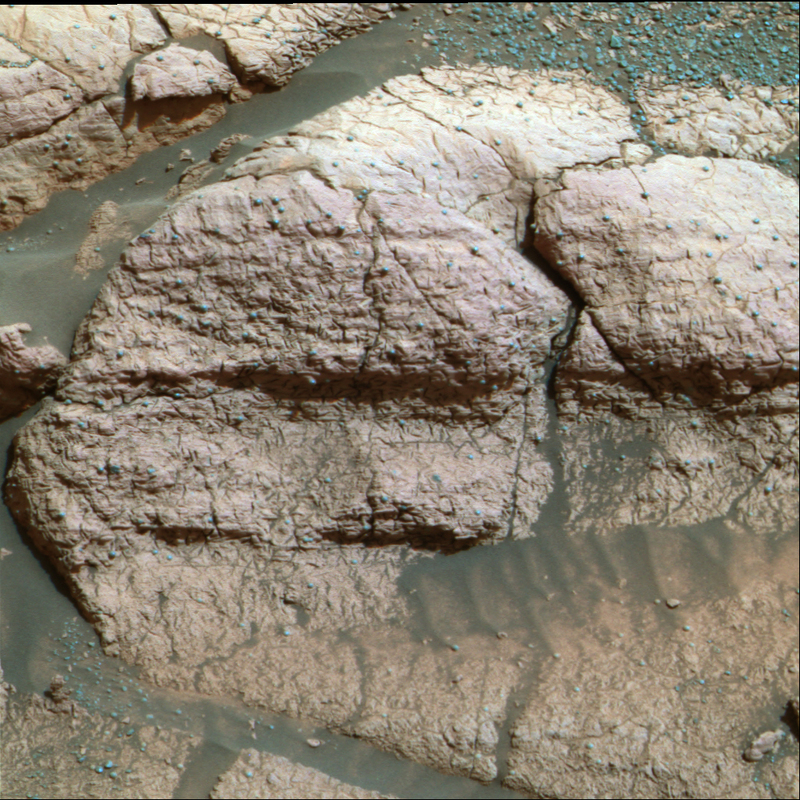 This image shows fine, parallel lamination in the upper area of the rock, which also contains scattered sphere-shaped objects ranging from 1 to 2 millimeters (.04 to .08 inches) in size. There are also more abundant, scattered vugs, or small cavities, that are shaped like discs. These are about 1 centimeter (0.4 inches) long. I think another stalked spherule appears as the bright silver spot in the left most of the two center overhang shadow. Check for the shadow cast lower on the rock face. The dust ripples at lower right appear to be down wind drifts caused by small obstructions lower in the picture. This means the wind is blowing as an updraft up the face of El Capitan. Until I saw this picture, I assumed they were regular ripples formed by a crosswind. The last comment concerns the 'fracture' area in the lower left. The spherules collected here also have drifts behind them from updrafts. But just down and right from here is a layer of thin dust. It appears you can see through this thin layer to the rock below. Now it looks like there is no diagonal crack running from upperleft to lower right. I am comfortable with the hypothosis that the vertical face of El Capitan is primarily eroded by wind driven sand, but can't come up with a satisfying hypothesis for the large cracks on the vertical face and the finer lines and cracks on the top surface. What process could round all the edges of the top layers? I like this color pic. The larger and smaller fractures were probably formed as a result of the impact that created the crater. All of the rocks exposed show evidence of being fragmented and shifted around. The large vertical fracture does look as if it has been enlarged by some weathering or erosional process. It's tempting to see it as an effect of flowing water. Probably wind abrasion, operating over a long enough period of time will do the same thing. The apparent crack at B1 appears to be filled with 'rind'. But when looking at the same region in the full scale jpg, I would say there is no rind filled crack, only dust covered rock. The dust appears to be coming from deflected wind off the lower (A2 area of pic) inverted V shaped rock ( McKittrick? ) that sticks out from the face of El Capitan. If my reasoning is correct, then the apparent channel at B1 was carved by wind blowing right to left up the face of El Capitan. While this particular area (B1) appears to be wind caused, I don't think it is probable the other rind filled cracks were caused by similar means. However, It also seems a bit implausable, that an impact would so neatly space the observed bedrock fragments. Has anyone heard Nasa's explaination of the rind filled cracks?